I’ve talked about Anderson’s Pals in Peril series a couple of times on this blog, so I won’t go into the underlying conceit of the books (which is very clever) or waste time convincing you, once again, that Anderson’s prose is very funny. Once again, Anderson delivers a quick, funny read, although in this case he’s replaced his high-flying spy-tastic adventures with an affectionate send-up of classic horror. As usual, I enjoyed it quite a bit. Still, I had a couple of small disappointments. For starters, the love triangle that put me off in the last book gets more pronounced in this one, and I pretty much can’t stand love triangles. That’s obviously a personal preference – your mileage, obviously, may vary. Second, Zombie Mommy introduces a new character, presumably a one-off: Katie’s cousin Madigan. Like Katie and Jasper (and a slew of characters from way back in Book 2, The Clue of the Linoleum Lederhosen), Madigan is the star of a series of books – in her case, the Snott Academy series, a clear parody of Gossip Girl and its ilk. Accordingly, Madigan is pretty, stylish, and a spoiled brat who spends the bulk of the book complaining, texting, and throwing herself at Drgnan, Jasper’s monk friend and the object of both Katie and Lily’s affections. Now, I’m not a fan of Gossip Girl-style series, and for the most part Anderson’s fairly scathing parody is funny. But there’s a very thin line between “making fun of books teenage girls like” and “making fun of teenage girls,” and Anderson skirts uncomfortably close to it in this one. Madigan does get a lot of funny lines and one or two moments of raw courage, but in the end she’s pretty much dismissed as useless and shallow and shipped back off to the Upper East Side (with [SPOILER REDACTED] in tow, but that’s beside the point). She’s certainly not the first character in this series to be portrayed as a one-note annoyance, but since she falls into a category that’s so often villified by kids’ books – the dreaded teenage girl who actually kind of enjoys being a teenage girl – it got my hackles up a bit. I wouldn’t go so far as to say I was offended by her portrayal; it was more that I wanted more from her. 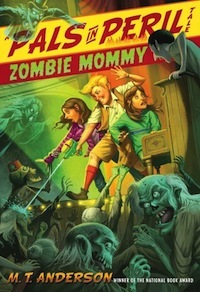 I did still enjoy Zombie Mommy quite a lot, of course, and I plan to keep reading this series. But this one didn’t quite hit the balance that previous ones have, and so it earns only four cupcakes. This entry was posted on Wednesday, January 30th, 2013 at 5:27 pm and is filed under 4 Cupcakes, Horror, Humor. You can follow any responses to this entry through the RSS 2.0 feed. You can leave a response, or trackback from your own site.